Getting out of the Las Vegas summer heat and heading into the mountains for ten days of relaxing beauty, history and fun!! Travel into Dinosaur National Monument, into the majestic American Rocky Mountains. Onward to Steamboat Springs. From there, it’s up and into Rocky Mountain National Park, the Black Hills, Keystone, Mt Rushmore. 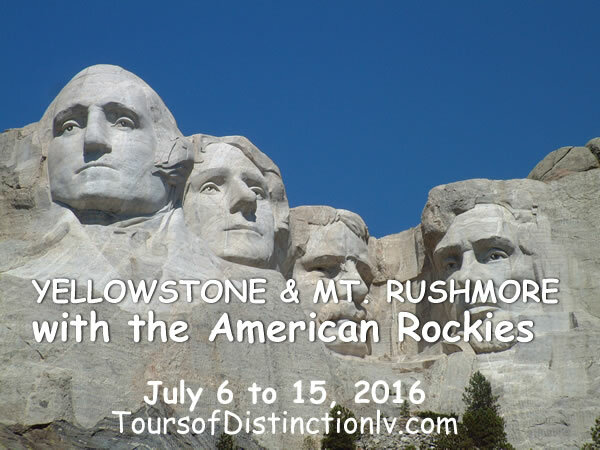 We visit the Crazy Horse Memorial, Deadwood and into Cody, Wyoming! Explore Buffalo Bill Historical Center, Yellowstone National Park, Old Faithful Village, Teton Range and Salt Lake City. Enjoy a guided tour of Temple Square before heading back home to Las Vegas. Another Successful and Fun Tour has Concluded.